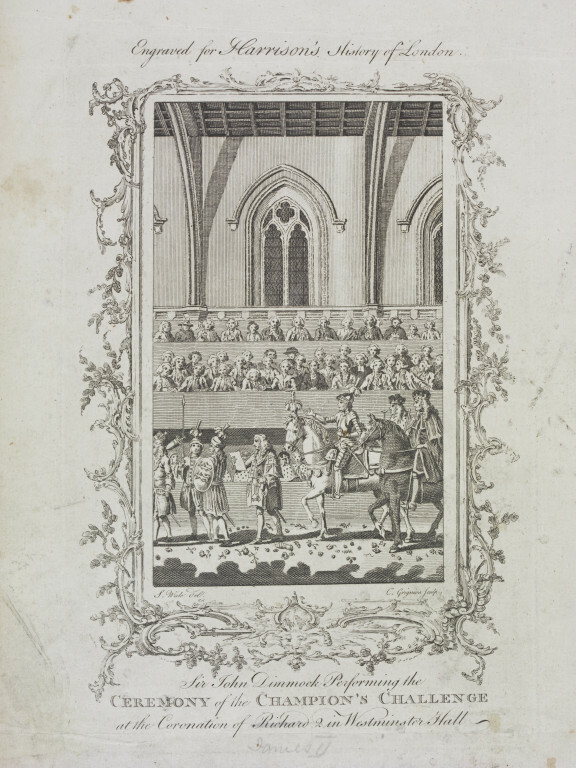 Print depicting a procession of heralds, a knight on horseback, and two peers; the procession route is strewn with flowers. In the background are stands with spectators. The plate has a border decorated with scrolled foliage. This print is a plate facing page 75 of A New and Universal History…of London by Walter Harrison, London, 1775. Although used as an illustration of the coronation ceremonies of Richard II, a Herald is wearing a tabard with the arms of George III. 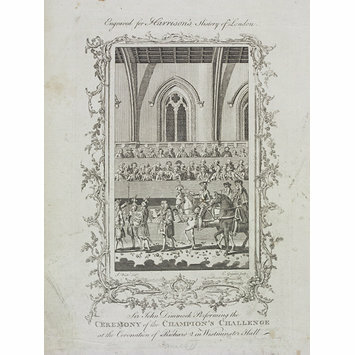 Print depicting the Ceremony of of the Champion's Challenge at the Coronation of Richard II in Westminster Hall; plate from 'A New and Universal History…of London'. Engraving by Charles Grignion after Samuel Wale, published 1775.